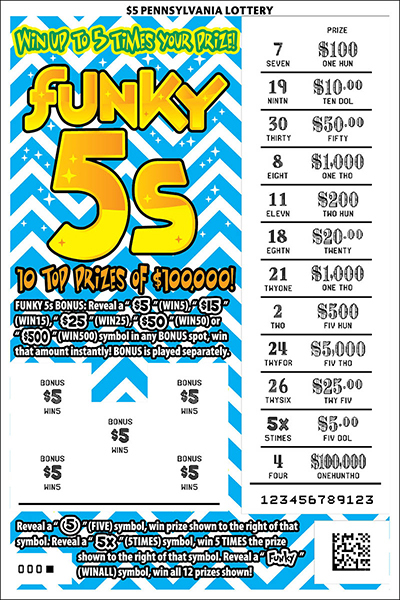 Funky 5s is a $5 game that offers 10 top prizes of $100,000. Reveal a “5” (FIVE) symbol, win prize shown to the right of that symbol. Reveal a “5X” (5TIMES) symbol, win 5 TIMES the prize shown to the right of that symbol. Reveal a “FUNKY” (WINALL) symbol, win all 12 prizes shown! 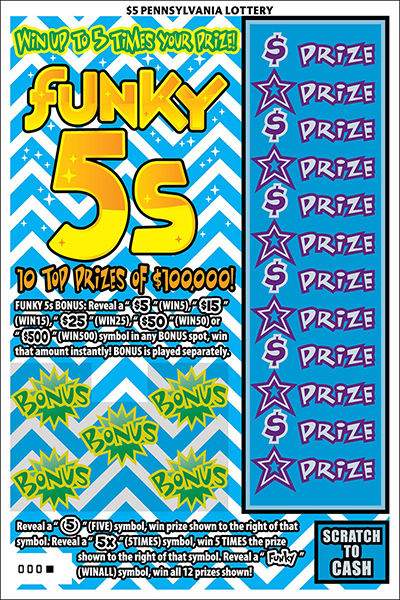 FUNKY 5s BONUS: Reveal a “$5” (WIN5), “$15” (WIN15), “$25” (WIN25), “$50” (WIN50) or “$500” (WIN500) symbol in any BONUS spot, win that amount instantly! BONUS is played separately.